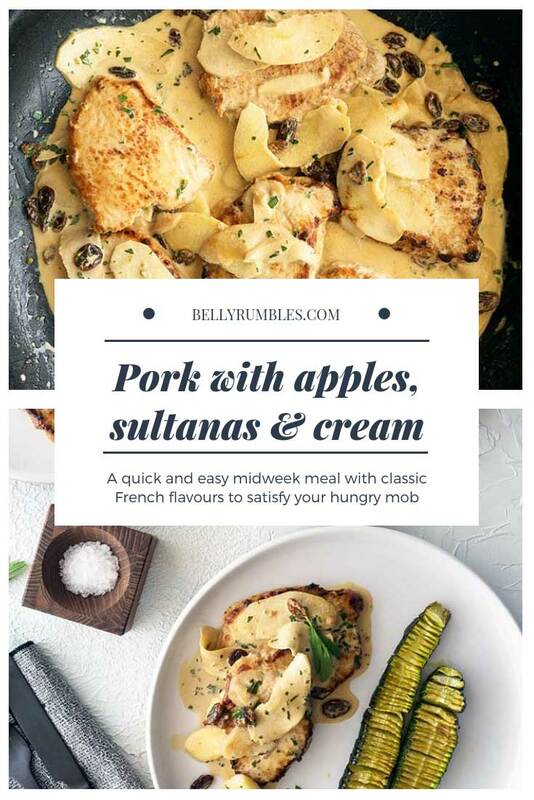 Home » Midweek classic French flavours, pork with apples, sultanas and cream. 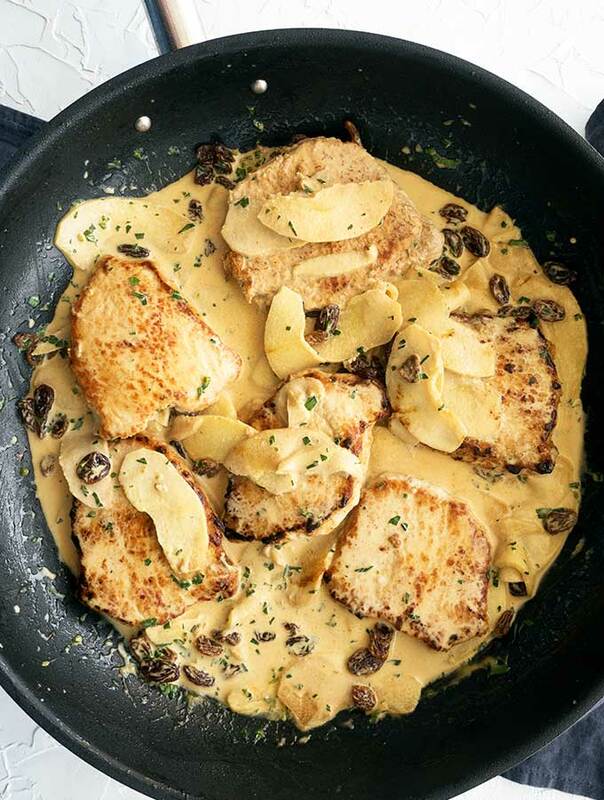 One pan pork with apples, sultanas and cream. 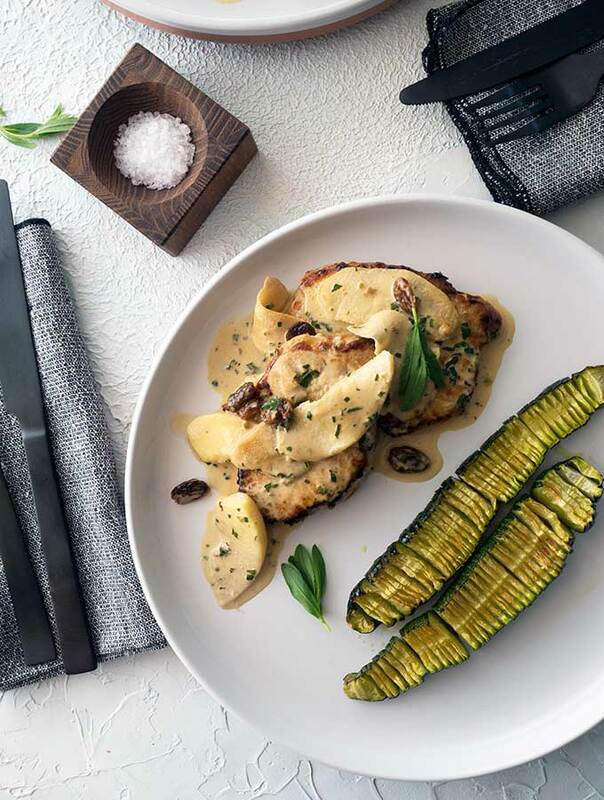 A quick and easy midweek meal with classic French flavours to satisfy your hungry mob. I’m lovingly sharing with you one of my mother’s recipes. My mother was an amazing cook with classic French cooking techniques. Mum knew the importance of a sauce to bring a dish together. A sauce with flavour. A sauce that will leave you running your finger over your finished dinner plate. Leaving you to devour every last trace. 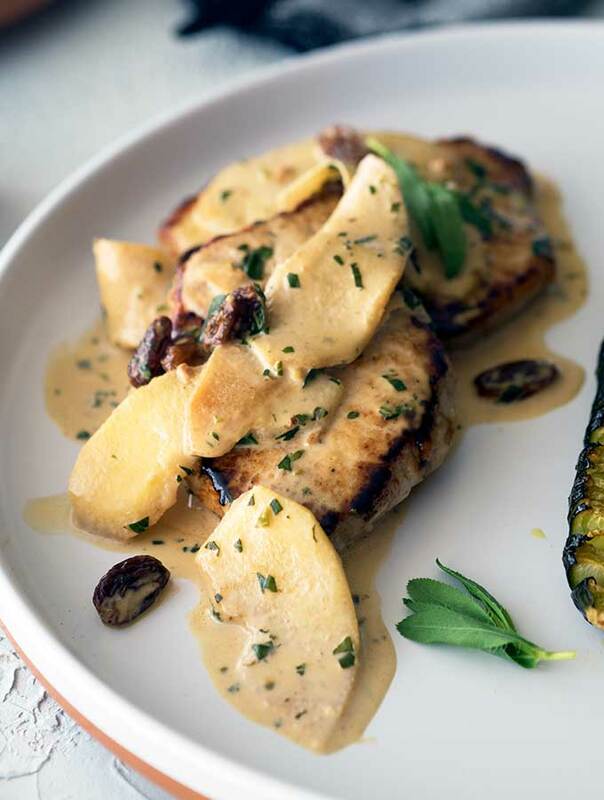 Mum’s pork with apples, sultanas and cream is one such a dish. It’s a simple dish with a simple sauce. A tasty easy one pan midweek family meal. 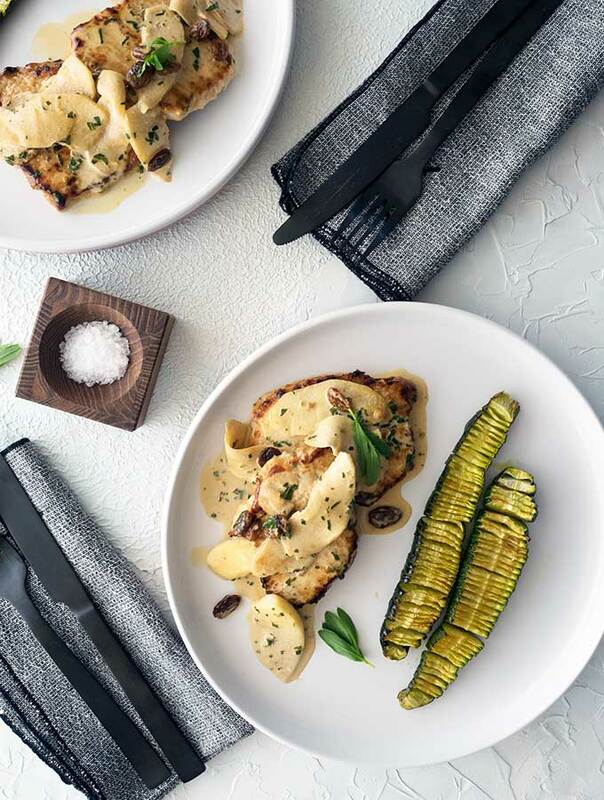 A meal with a little French flair. This recipe is simple and light on ingredients. The sauce relies on the pan juices and brown bits (fond) left over from cooking the pork. Do not wipe the pan clean before cooking the apples. The apples will in effect deglaze your pan. Capture all that flavour the pork has left behind to create a tasty sauce. Usually this dish is made with sliced pork tenderloin (pork fillet), that is how Mum made it. I picked up some delightful looking pork loin chops from my butcher and decided they would be perfect for this dish. I removed the thick layer of fat that runs along one side of the pork loin chop. You don’t have to, fat is flavour. But with the use of cream I wanted to make this dish healthier. Plus, the original dish uses very lean pork tenderloin. Don’t overcrowd the pork in the pan. You may need to cook the pork loin chops in two batches if your pan isn’t large enough. Do not over crowd the pork or the chops will stew and not brown. Cook the pork loin chops until they are just cooked, or slightly under. They will finish cooking when you return them to the sauce, you don’t want to over cook them. No special equipment is needed. This is a basic and classic style recipe using basic and classic equipment. Calvados is an apple brandy that is traditionally made in Normandy. 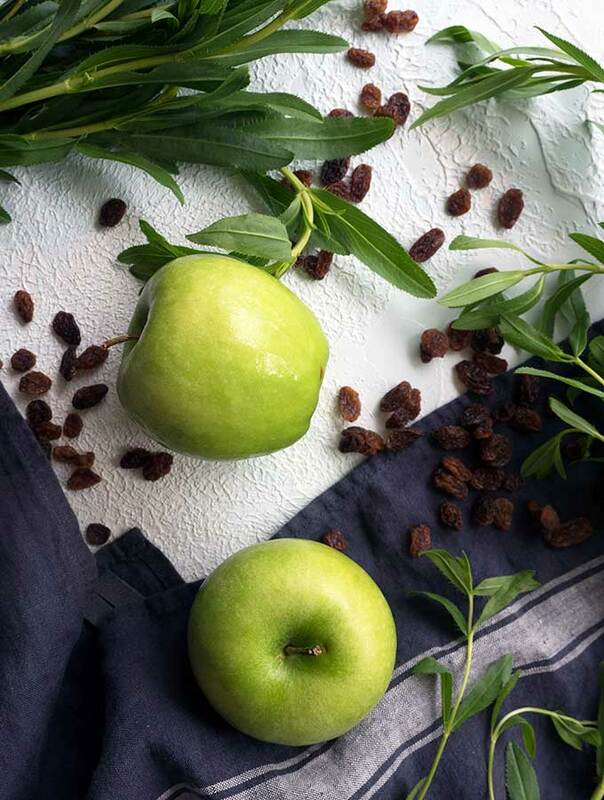 The brandy is made from apples instead of grapes and has a unique flavour. If you don’t have Calvados substitute 1 ½ tablespoons of brandy and 2 tablespoons of apple juice. Leftovers can be kept in an airtight container in the fridge. This recipe is not suitable to freeze. 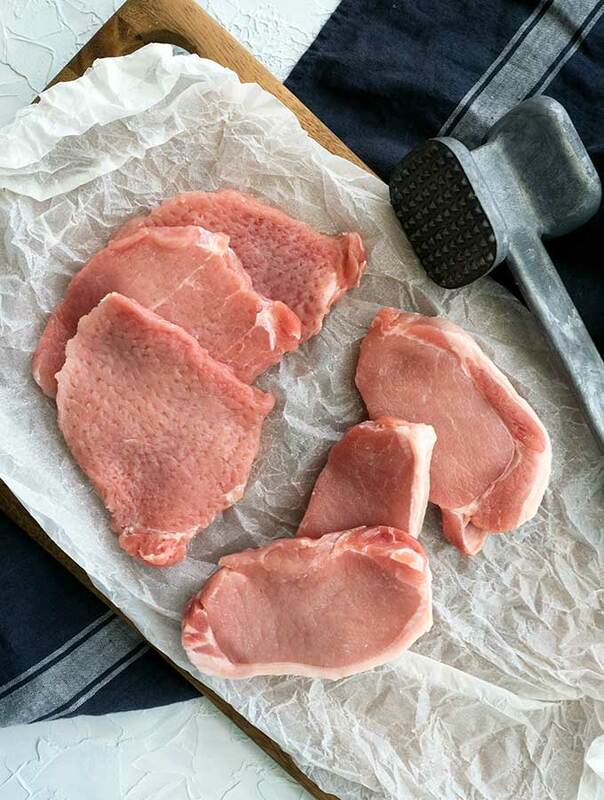 Remove thick band of fat that runs one edge of the pork loin chop and then pound with a meat mallet both sides to flatten. Heat butter and oil in a large heavy based pan and add pork. Cook over a medium high heat until just cooked through and browned on both sides. You may need to do this in two batches if your pan is not large enough. Do not over crowd the pork chops or they will stew and not brown. Remove pork from pan and place on a plate. Cover with foil to keep warm. Add sliced apple to the pan and cook, stirring, until browned and just tender. Add sultanas, tarragon, Calvados and cream to the pan. Stir and bring to a simmer and the sauce slightly thickens. Place pork back into the pan tow warm through and coat with the sauce. Serve immediately with sauce and apples spooned over the pork. pin me to save the recipe! This looks absolutely delicious – pork, apples and cream are a match made in heaven! Your photography is outstanding. What a beautiful range of delicious photos. I can’t wait to make this dish. 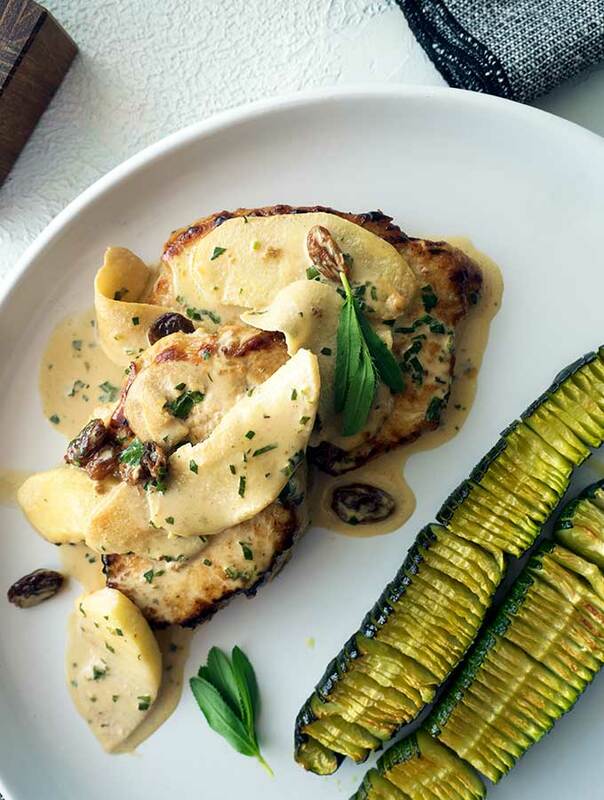 Pork and apple is such a classic combination and that gorgeous creamy sauce…! I love the addition of sultanas as well, I wouldn’t think to add them here, nice little twist! Quick, easy and delicious one pan meal! I love the flavors and the creamy richness! Oh wow! What a beautiful dish. I love how easy this is and how wonderful the flavours tie in together! Thanks for a great recipe. Interesting flavor combination! Looks absolutely delish! 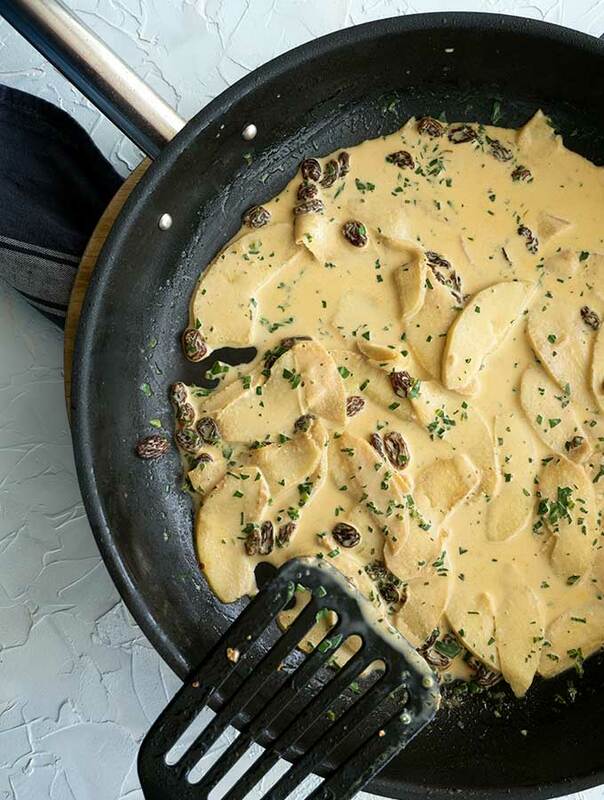 That apple and sultana sauce sounds absolutely divine! I am totally drooling over this recipe. Love the richness and the flavors. I have got to try this! Sauce sounds wonderful.. Bet it will taste heavenly with some Pasta too.